Earlier this month the European Space Agency’s Planck mission team announced that the first stars formed some 560 million years after the Big Bang. This is approximately 140 million years later than previously thought. It is an interesting result because it helps us to understand how structures such as stars and galaxies formed and evolved after the Big Bang. The Planck team were studying the Cosmic Microwave Background (CMB), the radiation left over from the Big Bang, the origin of our universe. The CMB can be traced to events that occurred only approximately 380,000 years after the Big Bang. 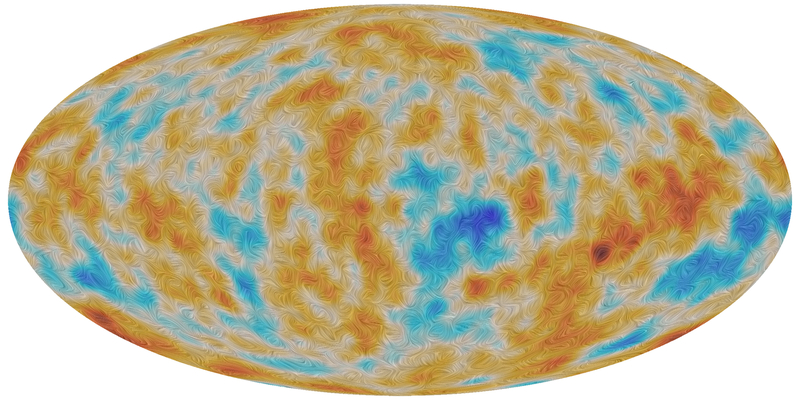 Polarisation of the Cosmic Microwave Background across the sky, the latest data from the ESA Planck mission. Since the CMB discovery about 50 years ago, astrophysicists have been analysing it to better understand the early evolution of our universe, accurately measure its age (approximately 13.8 billion years) and help us realise that the laws of physics do not properly describe approximately 95% of the universe that we live in. A short time after the Big Bang, almost all the ordinary matter created took the form of protons and electrons that, after 380,000 years, settled into hydrogen atoms (each atom is one proton and one electron bound together). Hydrogen is the simplest atom possible and the basic building block for everything we humans can see and touch in the universe (ordinary matter). The Planck result means that over the first 560 million years, under the influence of gravity, this hydrogen gas collapsed into stars. Inside stars, hydrogen atoms get combined into helium, oxygen, nitrogen, carbon and other elements. These elements end up in new stars, planets, oceans, DNA, iron ore deposits and so on. Quite useful stuff for humans. Stars really are the engines of life. But we currently know little about what happened after the first stars formed. If we fast forward the universe 500 million years, we know that galaxies were forming, because we can see a few of them, such as UDFy-38135539, at the limits of powerful telescopes such as the Hubble Space Telescope. If we fast forward again, another few billion years, the universe looks a lot like it does now, 13.8 billion years after the Big Bang. So how exactly did the universe go from hydrogen, to stars, to galaxies and to life? 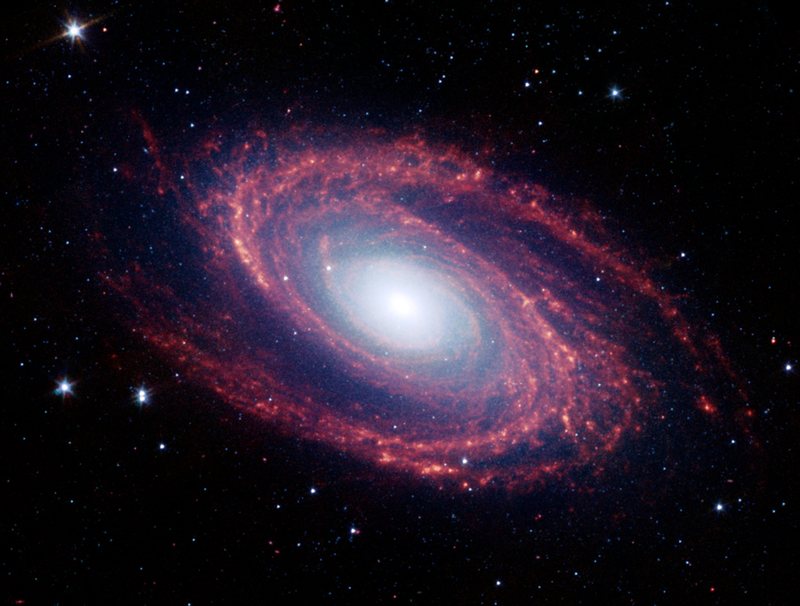 A Spitzer Space Telescope image of Messier 81, a spiral galaxy something like what our galaxy, the Milky Way, might look like if seen from the outside. Such a galaxy would contain billions of stars. Planck has narrowed things down for us with an exciting result – no stars before about 560 million years, and the universe is starting to look vaguely familiar roughly 500 million years after that. But those first billion years remain the last great unexplored period in the evolution of our universe (aside from the future of the universe). So how do we go about uncovering these mystery years of the early universe? Even powerful telescopes such as Hubble cannot examine the formation of the first stars as they are too distant and faint, and stars do not produce visible light until they turn on. Happily, astronomers have a different and powerful set of tools to crack this nut. Atoms of hydrogen emit radio waves with a specific wavelength of 21cm (similar wavelength to what your mobile phone uses). The hydrogen formed in the early universe produced these radio waves. By the time the radio waves travel all the way to us on Earth, through an expanding universe, they change their wavelength from 21cm to several metres (similar wavelength to what your FM radio uses). If we can “tune in” to the radio waves, we can watch what the hydrogen gas is doing in the early universe, 100 million, 200 million, 500 million or a billion years after the Big Bang. We can watch how the hydrogen gas forms into stars, how the stars are distributed, how long they take to form, how much energy they produce, and how galaxies start to form. As the stars turn on, their radiation breaks apart the surrounding hydrogen atoms, leaving a “Swiss cheese” pattern (see below) in the radio emitting gas for astronomers to detect and analyse. The Big Bang is at the left of this diagram. We live in a galaxy at the right of the diagram, 13.8 billion years after the Big Bang. This is a challenge that astronomers are now embracing, by building massive telescopes capable of collecting these radio waves, such as the Murchison Widefield Array (MWA). The MWA is located in the middle of Murchison Shire in Western Australia, well away from sources of human-made radio wave interference (mobile phones, microwave ovens, FM radio stations and cars) where we can pick up these faint radio whispers from the early universe. Over the past two years, we have used the MWA to collect 4 petabytes of data (the equivalent of over 5,700 hours of full HD video) and have produced more than 50 scientific papers from the data already. Part of the Murchison Widefield Array radio telescope, Western Australia. Our data are stored at the Pawsey supercomputer centre in Perth and we are sifting carefully through them using millions of supercomputer hours to obtain the first hints of the formation of the first stars and galaxies. Competition to make the first detection of these radio signals comes from other telescopes in the US, The Netherlands and South Africa. So unlocking the mysteries of the first billion years of the universe is a big scientific prize. But the MWA is only the first step needed to fill the gaps that Planck has so elegantly defined. A much larger radio telescope is needed, and that’s where the Square Kilometre Array (SKA comes in. The MWA is a A$50-million science and engineering precursor for the SKA, specifically the low frequency SKA, which will be approximately 100 times bigger than the MWA. The SKA, when it’s switched on sometime in the next decade, will fill in the first billion year gap in detail and help us understand how the universe transformed from hydrogen gas into us. The MWA is designed to light the trail for the SKA. Part of what the low frequency SKA may look like in the future. 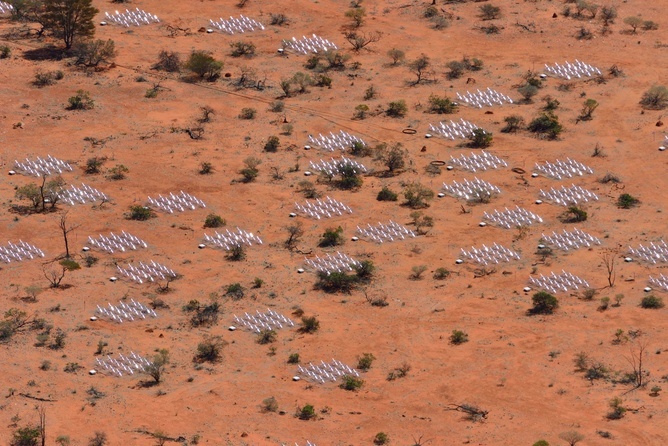 Hundreds of thousands of simple low frequency antennas spread over 10s of kilometres of the Western Australian outback. The great news for Australia is that this much bigger SKA facility will be built on the same site as the MWA, in Western Australia, learning from our solid and hard won experience, placing Australian science and engineering on page one of the next exciting multi-decade chapter in the unfolding story of cosmic discovery.